Walk around magic for your weddings, corporate events, and private parties. Have instant relief knowing I need nothing else from you after booking. My table magic is all self-sufficient. No need for a big stage, messy lights, or an intrusive speaker system. I come fully prepared and self-contained to entertain your guests with card and coin magic. The last thing you need to be worried about is the magician. Stop worrying about the stereotypical children’s magician. My magic is smart, stylish, and high impact. It’s been designed for entertaining adults, wedding guests, and corporate professionals. 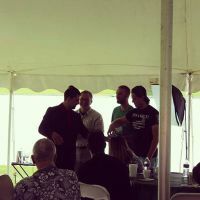 So rest easy knowing your guests are in the hands of a professional magician. Stop your guest’s anxious boredom, and have them treated to some unique and fresh entertainment. While doing strolling magic “That is amazing!" is the number one phrase I hear. This is rightfully so because there is no other way to describe it! I have been working Metro Detroit and all of Michigan from The Motor City Casino to Buffalo Wild Wings creating and evolving my act! Your guests will be talking all night with this great ice breaker. Not to mention they will be talking about you and how well you can plan a party.